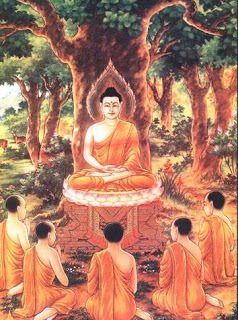 Our Lineages have a long history and tradition, and can be traced back all the way to the original source of Buddhism itself in this world, namely: the historical Lord Buddha Shakyamuni himself, as a Nirmanakaya Buddha. Of course, the other origin and main source of Vajrayana teachings, in particular, came from the “suchness”, or the true nature of reality and of phenomenal existence (Skt. Dharmata; Tib. 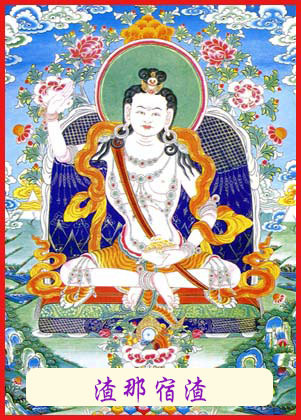 Chönyi), which manifested as the Primordial Dharmakaya Buddha Samantabhadra (Tib. 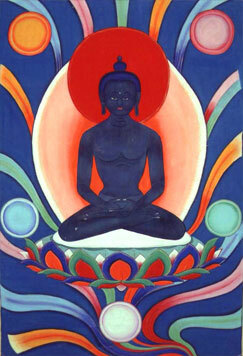 Kuntuzangpo), through the Sambhogakaya Buddhas Vajrasattva (Tib. Dorje Sempa), the Five Dhyani Buddhas, and the Nirmanakaya Buddha in human form Garab Dorje (Skt. Prahevajra), all the way down to our present-day Root Gurus in three main transmission lineages (Tib. bka’i brgyud pa gsum). Of course, there are also other lineages as well. 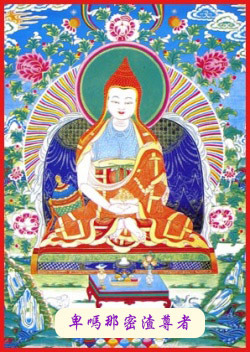 According to the Nyingma School of Tibetan Buddhism, the origin of the Vajrayana teachings came from the Dharmata which had manifested as the Primordial Dharmakaya Buddha Samantabhadra, who had transmitted the “Great Perfection” (Dzogpa Chenpo) teachings, in the three heavenly realms of Akanishtha, Tushita and the Realm of the Thirty-Three Gods, to the Sambhogakaya Buddhas Vajrasattva, the Five Dhyani Buddhas, and to the Nirmanakaya Buddha Garab Dorje. This kind of transmission has come to be known as the “mind-to-mind transmission lineage by Victorious Ones” (Tib. 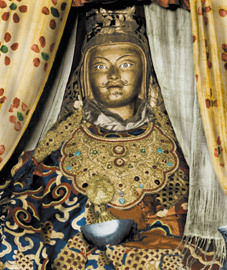 gyalwa gong gyü). 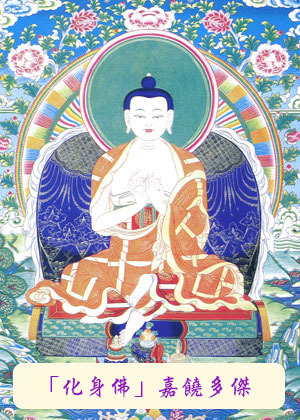 About fifty years after the Lord Buddha Shakyamuni’s Mahaparinirvana, the Sambhogakaya Buddha Vajrasattva further transmitted the sixty-four hundred thousand Tantras of the Dzogchen teachings to the first human Guru of Vajrayana, the Nirmanakaya Buddha Garab Dorje. This kind of transmission has come to be known as the “symbolic transmission lineage by Awareness-Holders” (Tib. rigdzin da gyü). 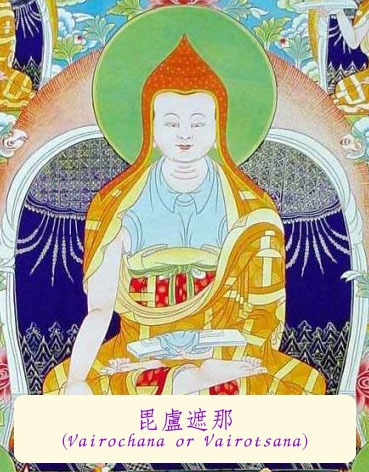 Garab Dorje transmitted the combined essence of the words, meanings and esoteric instructions of Dzogchen to the Mahapandita Manjushrimitra (Tib. Jampal Shenyen), who in turn passed the teachings in one single lineage to his principle disciple Shri Singha (Skt. Śrī Siṃha), who was born in the Chinese city of Shokyam in Khotan, and studied at first with the two Chinese masters Hatibhala and Bhelakirti. 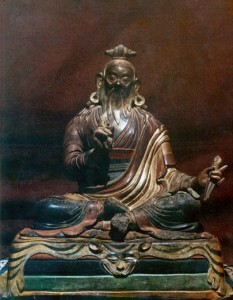 Shri Singha then passed on the Dzogchen teachings to his four outstanding disciples, who later became great masters themselves, namely: Jnanasutra, Vimalamitra (who was being considered as the greatest of the five hundred great panditas of India at that time), Guru Padmasambhava, and then later on to Vairochana (or Vairotsana), the Great Tibetan Translator. The transmission of the teachings from Garab Dorje all the way to our present day Gurus is known as the “oral transmission lineage by human individuals” (Tib. 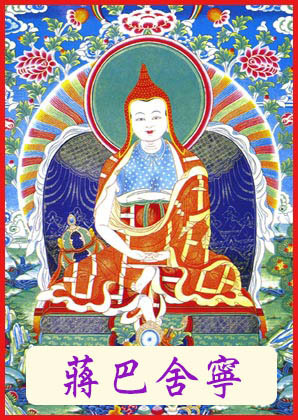 gangzak nyen gyü), which is transmitted in a way through oral teachings from the master through the hearing of the disciple in this human world. It was by the eighth century that Buddhism was introduced from India into Tibet by the Indian tantric master Guru Padmasambhava, together with the Abbot of Nalanda Khenpo Shantarakshita (Tib. Shyiwa Tsho). 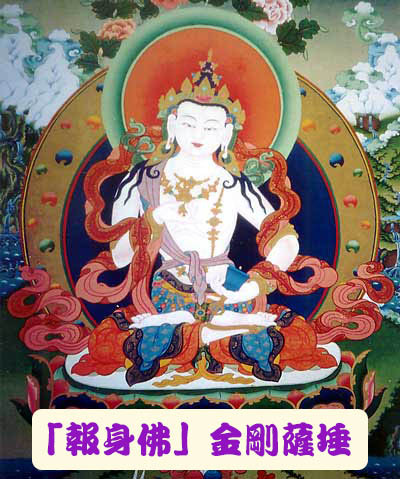 Guru Padmasambhava, being considered as the Second Buddha of our Time by the Nyingmapas (the Ancient Ones), had established a lineage of oral transmission which passes on the teachings from teachers to disciples. This distant and long tradition and lineage (Ring Gyu), known as the Kama Lineage, continues all the way unbroken up to the present. 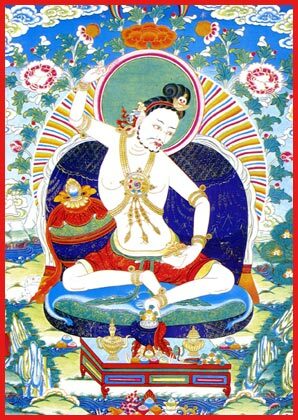 At the same time, Guru Padmasambhava and Wisdom Dakini Yeshe Tsogyal had concealed various types of “spiritual treasures” (known as “Termas”), which will be discovered by prophesized “revealers of spiritual treasures” (known as “Tertons”) at the appropriate times and places. This close and short tradition and lineage (Nye Gyu), known as the Terma Lineage, still contains the warm breath and the great blessings of Guru Padmasambhava himself. When the oral transmission lineage was spread into Tibet, it was transmitted in three different ways: through the distant Kama lineage, the close Terma lineage, and the extremely close Dag-nang (pure vision) lineage. 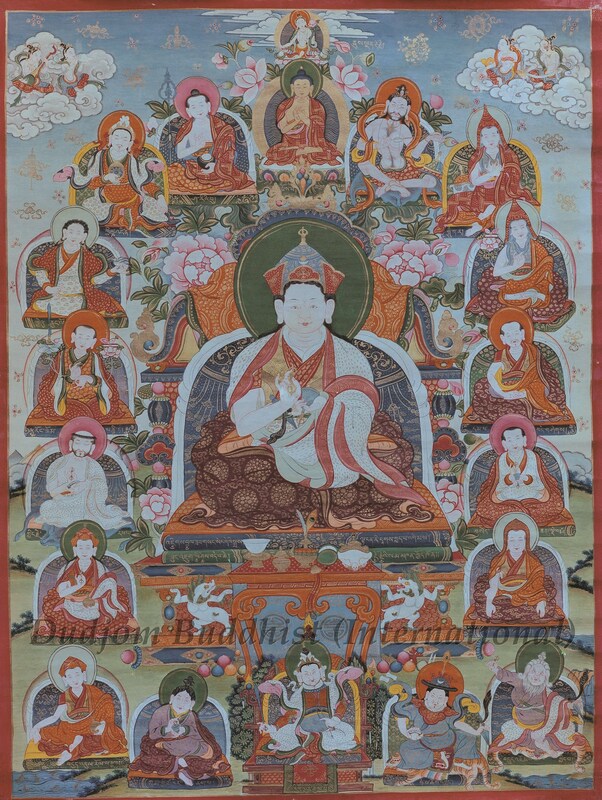 In the olden days of Tibet, there is no single head of the Nyingma school of Tibetan Buddhism. In the Nyingma traditions, all lamas and Dharma practitioners are acknowledged, regardless of whether they are fully ordained monks (Tib. gelong) or non-monastic practitioners (Tib. ngakpa; Skt. mantrin). 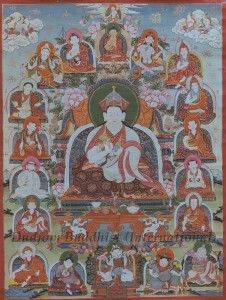 High Lamas and great practitioners that were acknowledged in the Nyingma traditions were mainly consisted of a number of great sages and saints, who were considered as the reincarnate Dharma Masters (Rinpoches) of several main important lineages of meditation practice and realization that had been passed down through the generations. Following the Tibetan diaspora in 1959, four High Lamas were appointed to head each of the four Tibetan Buddhist schools. There was an unanimous decision among the Nyingmapas to recognize the Great Terton His Holiness Kyabje Dudjom Jigdral Yeshe Dorje Rinpoche to be the first Supreme Head of the Nyingma School of Tibetan Buddhism. 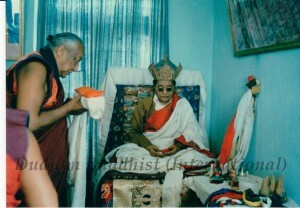 His Holiness Kyabje Dudjom Rinpoche, Jigdral Yeshe Dorje (1904-1987, Fearless Adamantine Wisdom), was a great realized master of the highest calibre, whose enlightenment was of a rare and most sublime quality. He was also one of the greatest Tibetan scholars in contemporary time, a prolific writer, and an incarnate lama who intentionally emanated for the sake of sentient beings through seventeen successive lines of incarnations. 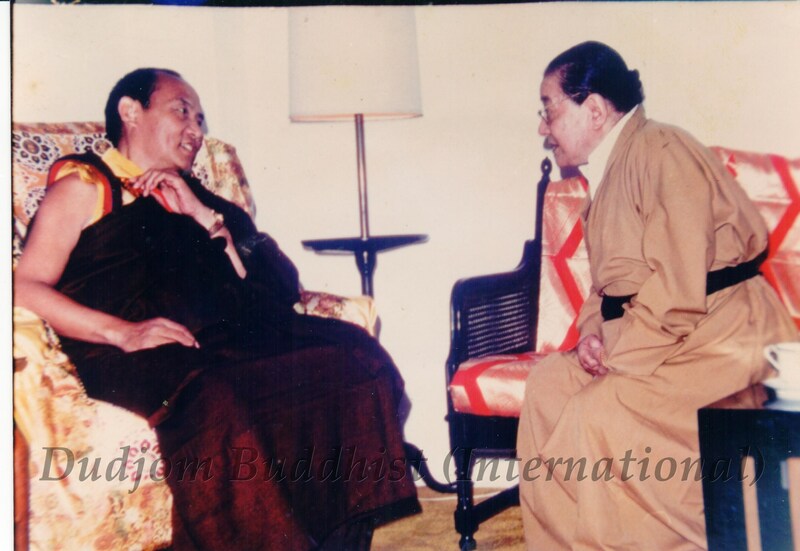 In this way, His Holiness Kyabje Dudjom Rinpoche had descended through a prophesized line of twenty incarnations. 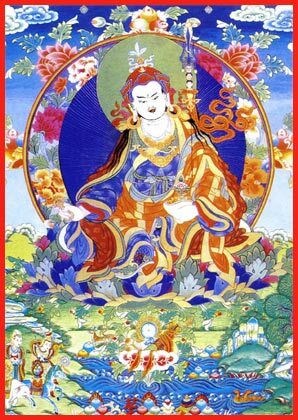 In fact, his present 18th incarnation was considered by all the Nyingmapas as the Regent of Guru Padmasambhava in contemporary time. Like many of his predecessors, His Holiness Kyabje Dudjom Rinpoche was also renowned as a Great Terton, a discoverer of concealed treasure teachings that were hidden by Guru Padmasambhava, which are now widely practiced and propagated. These are primarily the “mind treasures” of the awareness-holders concerning the “Inner Tantras” of the “Secret Mantrayana”, which can bring about the unsurpassed enlightenment of the rainbow body in one single lifetime. His Holiness Kyabje Dudjom Rinpoche was the immediate reincarnation of the Great Terton Traktung Dudjom Lingpa (1835-1904). Both of their Termas offer particularly powerful pathways to spiritual realization and personal liberation. 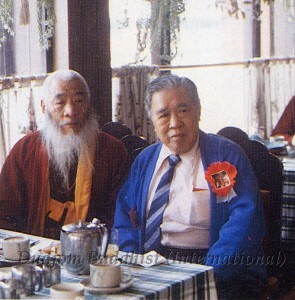 Collectively, both of their Termas are known as the “Dudjom Tersar” (or the “New Treasures of Dudjom”). 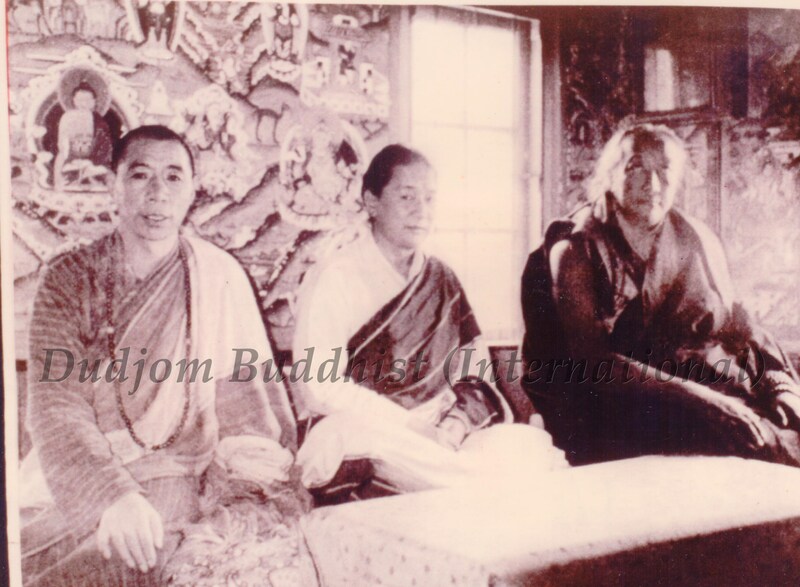 Hence, the Dharma Lineage that has been passed down from both of them came to be known as the “Dudjom Tersar Lineage” of the Nyingma School of Tibetan Buddhism. 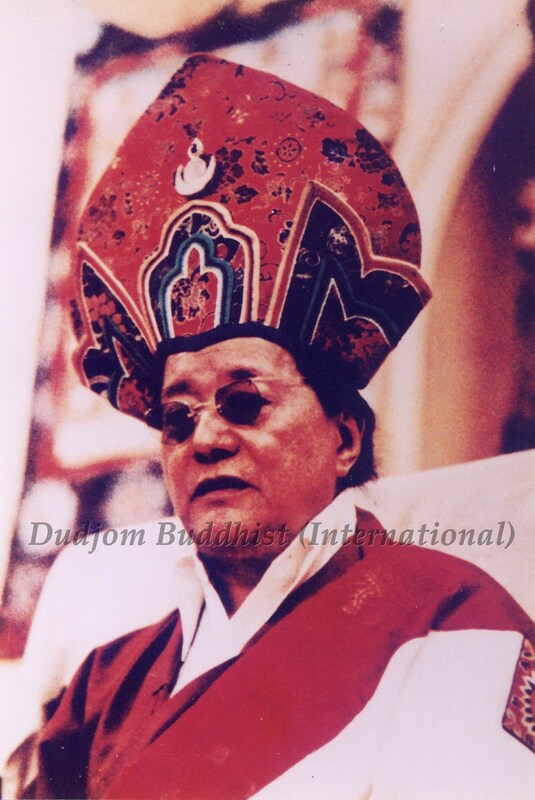 His Holiness Kyabje Dudjom Rinpoche had saved, collated, re-edited, and published most of the important historical Nyingma-transmitted texts and Tantras, including the fifty-eight volumes of the “Nyingma Kama”. All around the world, he founded vigorous practice centers and monasteries. Above all, His Holiness Kyabje Dudjom Rinpoche had further preserved, protected and passed on the completely authentic meditative and yogic training system of the “Secret Mantrayana”, which continues to have the same power, scope and results here and now as it had been in the old days of Tibet. In this way, the lineages and traditions that we have inherited from Our Three Most Beloved Crowning Jewels (Root Gurus, that is: His Holiness Kyabje Dudjom Rinpoche, Ven. 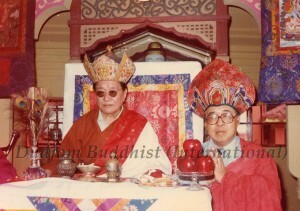 Lama Sonam Chokyi Gyaltsen, and His Holiness Kyabje Chadral Sangye Dorje Rinpoche) of the Nyingma School of Tibetan Buddhism continues on all through the past twelve centuries down to us, and that their lineages and traditions are now being kept, maintained and upheld by our two present Vajra Masters Yeshe Thaye and Pema Lhadren, who have founded our Dudjom Buddhist Association (International), in order to repay the extreme kindness and compassion of His Holiness Kyabje Dudjom Rinpoche to the Chinese people in the Chinese soil, and beyond. Increase and spread throughout the Three Realms of the world. And bring sublime well-being throughout the Three Times. 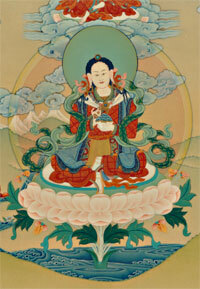 Dudjom Lingpa is the Chariot of the essential true meaning. Without sinking, through study and practice.